With New Year’s Eve right around the corner, shows and parties all vying for your attention have been announced all over town. Whether big or small, pricey or cheap, musical or non, you have your pick from countless ways to spend your final hours of 2018, but if retro cool, vintage rockabilly, humor and satire, and a macabre fixation all sound up your alley, Unknown Hinson‘s performance New Year’s Eve, Dec. 31 at Exit/In with Olivia Jean promises to be a fun, incredibly entertaining, and relatively intimate option. Tickets are still available here, but we’re also giving away a pair of tickets to one lucky fan! Read on for more about this super cool show, and enter for a chance to win tickets below. Born Stuart Daniel Baker, the musician who would eventually become Unknown Hinson spent his early years raised by a musical family in his native North Carolina, performing in bands, doing session work, and generally honing his guitar skills, even spending a stint in New York, before returning to the south and inventing the Hinson character for his public access TV show, The Wild Wild South. Hinson’s fictional backstory goes as such: the womanizing, hard drinking, gun-loving country troubadour was born to a single mother and “unknown” father (hence the name on his birth certificate), raised on guitar and classic country, before being abandoned as a kid and forced to join the circus. After being framed for murdering his boss, he was incarcerated in Illinois as a young man, and did 30 years in prison, where he spent time honing his musical chops and informing his rough ways, emerging in 1993 as a hit-making, country and western tinged psychobilly performer, who may or may not also be a vampire (Hinson, in character, leans into this idea, but never quite outright claims it). First with The Wild Wild South, then, after the real life death of his co-star, the spun off Unknown Hinson Show, Baker spent the ’90s refining the character, which is part satire and comedy act, but with a legitimately great songwriter and performing beneath the surface. Since the turn of the century, Hinson has become something of a cult musical figure, touring the country and releasing a string of albums, gaining high-profile fans and sharing the stage with the likes of Hank Williams III, Billy Bob Thornton, Reverend Horton Heat, and Marty Stuart. Though he planned to retire from the road a few years back, the death of his wife and business partner shortly thereafter led to a return to tour life, and as the years have gone by, Baker has increasingly committed to the Hinson character, rarely acknowledging the act or appearing out of costume. Since 2005, Baker has also gained notoriety for voicing Early Cuyler, the lead character in cult animated series Squidbillies on Adult Swim, a character which holds strong parallels to his own southern caricature persona (and a creative outlet arguably more widely known than his music). 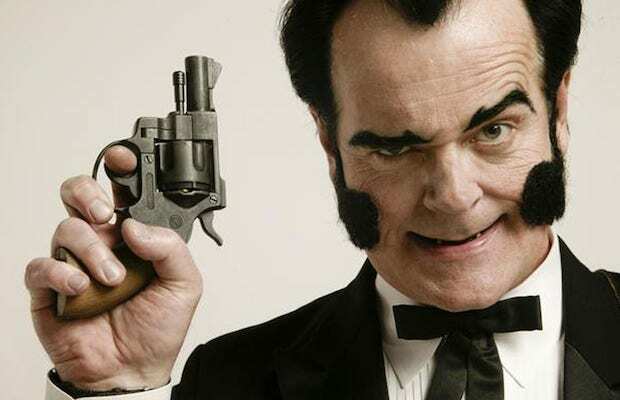 Hilarious and bizarre, and also a seasoned and incredible performer, Unknown Hinson is an artist you have to see live at least once in your life, and is sure to be a supremely fun and entertaining way to ring in the new year! On the surface, local singer Olivia Jean bears some similarities to Unknown Hinson, adopting her own ’60s inspired style, jet black hair, and a fondness for vintage rockabilly. However, while a certain degree of her artistic persona is “put-on” (few artists’ aren’t), she’s not an outright character or alter-ego like Hinson. After several years of cutting her teeth backing artists like Jack White, Wanda Jackson, and Karen Elson, then subsequently fronting all-female “garage goth” outfit the Black Belles, Jean emerged with her debut solo album, Bathtub Love Killings, in 2014, flexing her unique style and artistry, playing nearly every instrument, and making strides to unbundle herself simply from the shadow of Third Man collaborator. We’ve been hoping for a followup ever since, and, while Jean has been taking her time, she’s continued to bring her macabre obsessed, retro cool sound and style to the stage at an intermittent clip, though it’s still a treat anytime we get to see her at home. Don’t be late! Winner will be announced Friday, Dec. 28 at 10 a.m. CST, and will receive one pair of tickets. Good luck! Win Tix to Unknown Hinson at Exit/In! Unknown Hinson and Olivia Jean will perform Monday, Dec. 31 at Exit/In. The show is 18+, begins at 9 p.m. (doors at 8 p.m.), and tickets are available to purchase for $20-25.